What exactly do we celebrate on 26 January, and why? Another Australia Day, another fracas. Once, when it was always the last Monday in January, we ate our sausages and never gave a thought to the First Fleet, but not any more. In the lead-up to the Bicentenary in 1988, Canberra decided that it had to be massive. All government people – especially those like me working with history – were strongly encouraged to get on board. At the time I was on the payroll of the Port Arthur Conservation Project. Writing a film script about Port Arthur, I found myself comparing our bicentenary with an earlier one. On 4 July 1976 the United States celebrated 200 years since the American colonies declared their independence from Britain. “Two centuries ago, an old, old land and its people were visited by an alien race, travellers from a place unbelievably distant. “The strangers brought with them no grace or goodwill, no blessings or benefits. Their gifts to the land they claimed as theirs were their own social outcasts, the people they did not want. “The newcomers seemed to fear this vast land they would call Australia. They clung to the coast, at first settling on a harbour they named Port Jackson, then slowly spreading to other coastal enclaves. I was questioned about calling it an “invasion”, but my masters let it stand because they didn’t know what else to call it. Knowing that humans were already living here in 1788, it’s a struggle to explain why 26 January, important as it is, is something to celebrate. When NSW premier Henry Parkes took charge of Sydney’s 1888 centennial party he said he wanted everyone involved. Someone asked whether that included Aborigines. “And remind them that we have robbed them?” he retorted. How should we respond to such an obvious truth? The Australian Natives’ Association, which 100 years ago was the main driver of a national day on 26 January, chose to believe that Aboriginals were a dying race and therefore irrelevant to the nation’s story. To join ANA you had to be a white man born here. A 1910 ANA badge bore the slogan “Australia for the Australians”, with the words “White Australia” written over a map of the continent. 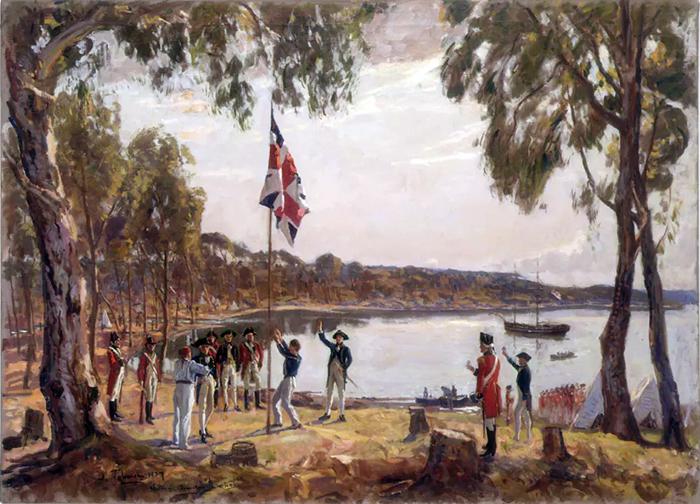 The ANA’s platform of an independent federation was based on the firm belief that Australia began with the arrival of the British. That was the message which the 150th anniversary parade through Sydney in 1938 sought to press home. As Australia Day historian Elizabeth Kwan noted, participants in this massive event included 26 Aboriginal people brought from outback NSW “to act out Aboriginal resistance to the British landing, and to pose on the first float in the pageant”. That formula – a re-enactment in which Aboriginal people greeted the British and bowed to their authority – became the standard for Sydney’s Australia Day ceremonies in later years. But there was another event in the same city on that day in 1938. Members of the Aborigines Progressive Association met in George Street to declare a “Day of Mourning”. The group struck out at “the callous treatment of our people by the whitemen during the past 150 years” and the use of “the whitemen’s seizure of our country” as a basis for celebration. Though oppressed, marginalised and deprived of citizenship, these people refused to remain silent. For years we never questioned the origins of the 26 January holiday, or its impact on Aboriginal people. Now the wheel has turned, and we are having to confront what the date means to those first Australians. Some are bemused at this, others angry, but it will never go away. The only official response to Aboriginal disquiet about the date in recent years has been the decision by a handful of local councils not to hold citizenship ceremonies on 26 January. Now the federal government plans to force all local councils to mark and support this now-contentious date. Coercing local authorities to join in may be a sure way to win a battle, but it will surely lose the war. Invoking the law against actions of conscience, far from making them go away, will only make them more likely. Our national birthday is going to remain a bone of contention. Scott Morrison has already put his finger on the problem, if unwittingly. A month into his prime ministership he said that “the course of the nation changed” on that day in 1788, acknowledging that a nation existed before 1788. That earlier Australia is now demanding to be heard. Far better that the government accepts this issue as genuine, stops pretending 26 January is sacrosanct and starts looking for a birthday we can all share, one that doesn’t celebrate dispossession. Because until we do we will remain a fractured nation, and a lesser one.